The University of Arizona Spring Archaeology Field School has been conducted at the Guevavi Mission in 2013 and 2014, under the direction of Dr. Barnet Pavao-Zuckerman of the University, Homer Thiel of Desert Archaeology, Inc. (DAI), and Jeremy Moss of the National Park Service (NPS). The Mission site is owned by the National Park Service, as part of the Tumacacori National Historical Park, and the City of Nogales. A 2011 mapping project revealed that features exposed in an existing roadbed were being damaged by traffic and erosion and burrowing animals were damaging a Mission-era trash midden on the NPS property. Archaeological fieldwork has two primary goals: 1). To aid in the management and interpretation of the archaeological resources at the Guevavi NPS Unit, and 2). to provide information in support of the protection of the entire Guevavi site. Units were placed within the midden on the NPS portion of the site, yielding large quantities of trash from stratified deposits. Copper ore and slag found at the top of the midden probably relates to the occupation of the site by Yaqui miners in the 1810s. Lower levels contained Mission-era Native American ceramics, Spanish olive jar fragments, Mexican majolica, Chinese porcelain, metal items, and large amounts of faunal bone and plant remains, including maize cobs and peach pits. A structural mound in a road was investigated to determine whether it was an early church. 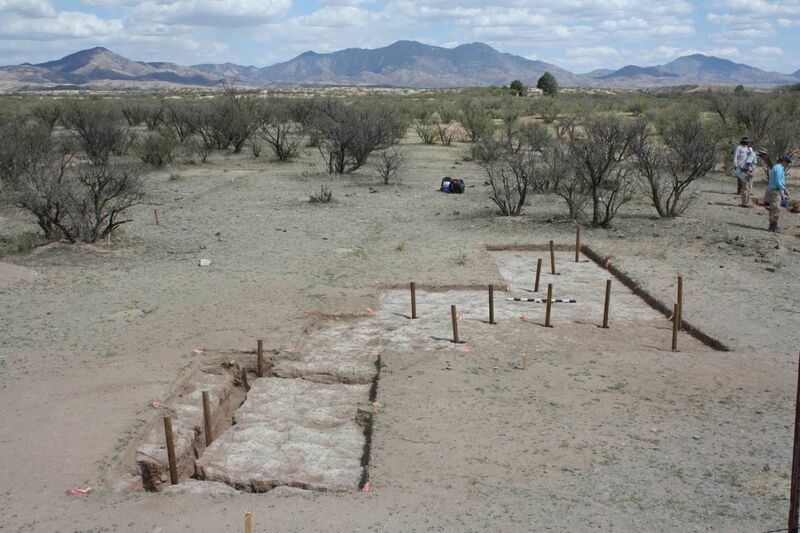 Aerial photographs of a large light-colored soil area revealed possible wall alignments. These proved to be trenches for an animal pen area, likely used to manage Mission-era cattle and sheep herds. Prehistoric pit structures and roasting pits have been explored, revealing that occupation of the site took place during the Hohokam Sedentary period. The presence of many Early Agricultural period projectile points suggests features from that timespan are nearby, but have yet to be located. Student research has focused on faunal remains and an examination of animal pens from Sonora, Mexico. Ongoing research included soil analyses, in an attempt to identify telltale signs of animal manure, and chemical analyses of animal teeth, to study the origins of the cattle found at the site. To date 21 students have participated in the field school.